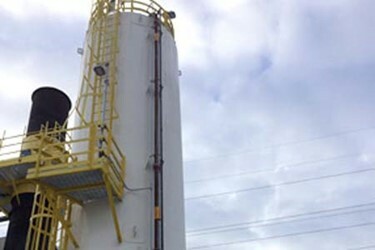 Dry Sorbent injection facilitates SO2 removal of 90%+. UltraCat Catalytic Filter Systems have an option for dry sorbent injection of calcium or sodium-based sorbents (hydrated lime, sodium bicarbonate, trona) to control SO2, SO3, HCI and HF. With dry sorbent injection in the duct, upstream of the filters, the additional particulate from the sorbent is captured easily along with the other pollutants. The SO2 removal reaction occurs within the duct prior to the filter and at the filter cake that accumulates on the filters’ surface. The reaction of the sorbent with the acid gas creates a solid particle that is also captured on the filters along with the unreacted sorbent and the process particulate. With dry sorbent injection, SO2 removal is typically 90 percent or higher, with removal efficiencies as high as 97 percent. HCl removal is typically 95 percent, and often as high as 99 percent. Temperature range for effective removal is 300°F to 1500°F. Dry sorbent injection and new engineered sorbents have revolutionized dry removal of SO2, SO3, HCI and HF. Hydrated lime sorbents are easy to dispose of in landfills because of minimal leaching. High SO2 removal is possible without the cost and complexities of spray-drying or wet waste. Ceramic filter systems that remove acid gases such as SOx and HCl also capture all PM in the process gas to very low levels. These systems can also be configured to simultaneously remove NOx, dioxins, O-HAPs, and mercury. 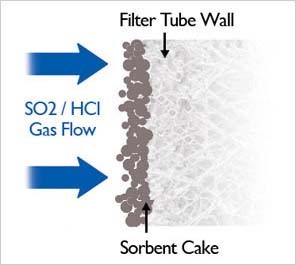 The ceramic surface provides a stable foundation for the sorbent cake for maximum SO2 removal.